Finding the best dog food for your Boxer is not an easy task. Well, there are practically thousands of dog food brands out in the market and almost every dog food looks like a great product from the outside, even though the majority of them are not. Most of the time, we buy a product because it’s popular or we saw an advertisement on TV, newspaper or online. But just because a dog food brand is popular, it doesn’t necessarily mean it’s a great choice for your dog. Boxers are cheerful and brave muscular dogs. They are very energetic too, even at old ages. That’s why they need high-quality calories in their diet to maintain their muscular body and support their active lifestyle. To choose a dog food for your Boxer, you must look at the ingredients first and make sure that the main sources of these calories come from quality proteins and carbohydrates. To help you with this process, we have reviewed several different dog foods for Boxers and decided to present here the ones we feel really stand out from the crowd. Note: Above ratings are based on our experience with the product and/or expert opinions. Click the link above to read customer reviews and see the current prices on Amazon. Boxers are medium to large-sized muscular dogs. They are playful, devoted, loyal and friendly, making them ideal for families with children and other pets. It’s typically a patient and protective breed and they are always eager to please their masters. They are generally 21-25 inches high and weight around 55-70 lbs. Just like any other dog breed, their females are slightly lighter in weight and smaller in size than their male counterparts. Boxers are very confident, fearless and brave dogs which make them one of the best guard dogs. 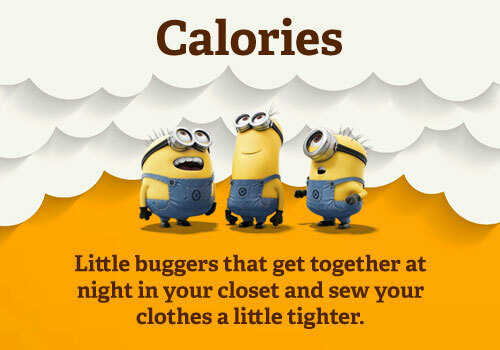 Note: The estimated calorie requirements below are primarily based on the average weight of Boxers. Before making any significant changes in your dog’s diet, please consult with a veterinarian. To support their high energy and activity level, Boxers need 1150-2300 calories of diet per day. Older Boxers require as few calories as 1150 since they lead a low-activity lifestyle. However, an adult Boxer needs a better diet than puppies and older dogs, they need around 1600 calories and it can reach as high as 2300 calories for working and more active Boxers. It’s important to note that the calorie estimation below is based on the average weight of a Boxer. We considered it to be 65 lbs, but if your dog is lighter or heavier than that, you should adjust his diet accordingly. Adult Boxers must be fed according to a dietary plan and free feeding should be avoided in any circumstances. However, feel free to reward your dog with occasional treats, but strictly for training purposes. Feeding excess food to your Boxer is dangerous for his body and overall health. He will become overweight which may lead to many serious health related problems, such as bloat, diabetes and hip dysplasia. Boxer puppies only weight a few pounds, but they are sure to grow into 60-70 lbs massive dogs. So feeding good quality wholesome diet to your Boxer is very important for his physical and mental health. A balanced diet will not only affect their overall health, but will also increase their life span as well as the quality of life. Protein is one of the most important parts of any dog’s diet as it is used for bone growth, development of strong muscles and tissue repair. Being large and energetic dogs, Boxers require a higher protein percentage in their daily diet than any other dog. Although many nutritionists and experts recommend including 25%-30% of proteins in a Boxer’s diet, some Boxer enthusiast advocate giving even more, up to 35%-45%. In fact, increasing protein intake in your dog’s diet is highly beneficial for him, as research indicates that extra protein in a dog’s diet helps it reduce common injuries by strengthening its muscles. When you look at the protein part of your dog’s diet, it’s very important to remember that the protein sources are just as important as the amount. Lean chicken, turkey, lamb, tuna and eggs are great sources of protein for a Boxer’s diet. Protein coming from beef/chicken by-products is useless for your Boxer as it is the lowest form of protein. It’s widely used in popular dog foods though because it’s inexpensive and easily obtainable. You should also avoid dog foods which contain low-quality grains as their top 5 ingredients. Grains, such as wheat, corn, soy and yeast are known to cause many food related allergies in Boxers. Fat is another main component of your Boxer’s daily diet and it’s another source of energy. It helps your dog with its coat and keeps the skin healthy and shiny. Fat also plays an important role in digestion and help maintain a stable body temperature. Almost all food brands keep fat content at a satisfactory level as it is added to boost the flavor of the dog food. That’s why you probably don’t have to worry about it while picking up a dog food for your buddy. Dogs typically need a minimum of 10% fat in their diet, but ideally, it can be between 15%-30%. Since Boxers have a small coat and hair, they require less amount of fat than other dogs. Just like humans, excess fat is not good for Boxers either. It puts your dog at a higher risk of many heart related diseases. Carbohydrates provide energy and aid digestion in dogs. That’s why carbs are as important for your Boxer as fats, only there are no minimum or recommended levels of carbohydrates intakes defined for dogs because it has been proven that completely excluding carbohydrates from a dog’s diet does not deprive him of robust health. Carbohydrates mainly come from grains and grains are a common cause of many food allergies in Boxers. 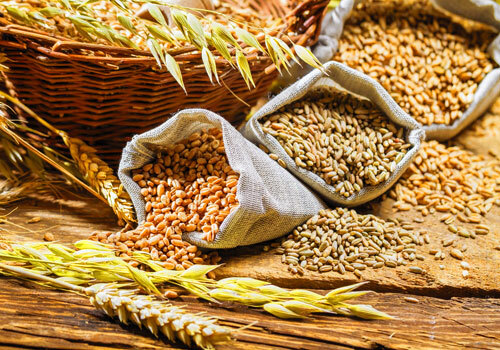 You should always choose grain-free or low-grain dog food, although even higher quality grains, such as barley, brown rice, oatmeal and sweet potatoes, are acceptable carbohydrate sources. Most high-quality dog foods are formulated with all the vitamins, minerals and other nutrients your Boxer will require. That does not mean you can simply pick any dog food you want. In a dog food, we like to see lots of vegetables and fruits since they are excellent sources of needed vitamins and minerals. Calcium is necessary for our Boxer’s bone and joint health. Vitamin A is necessary for a healthy, shiny coat and hair. Vitamin B protects its nervous system while L-Carnitine and Taurine keep its heart healthy. You should pick a dog food with a wide variety of vitamins and minerals. The more variety, the better. Water is perhaps the most important nutrient in a balanced diet of any mammal. Just like it does for humans, water also helps Boxers with digestion and helps their bodies absorb nutrients. The amount of fresh drinking water required for a Boxer depends on many factors, including its age, activity and exercise levels and, of course, weather. However, an average adult boxer needs to consume at least 85 ounces of water every day to maintain its health. So in general, Boxers need about 1.3 ounces of water for each pound of their total weight. Avoid any dog foods that contain wheat, corn and soy as their main ingredients. These ingredients are fillers that provide little to no nutritional value to your dog and it just passes through its stomach. Fillers can cause many gastric related problems and allergic reactions in Boxers. Manufacturers use these ingredients because they are cheap and easily obtainable. All dog food brands include meat in one of three different forms, Meat, Meat by-products and Meat Meal. Meat by-products are commonly used in most dog foods and are the lowest form of protein. Meat by-products are unhealthy and unhygienic since they sometimes come from dead animals or expired meats. They usually contain animal cognitive tissues and bones which are not healthy for a Boxer to consume. Meat Meal is actually the best of all three as it is essentially the same as Meat, only without water. We highly recommend choosing a food that contains Meat Meal. Foods which contain salt, sugar, preservatives, artificial coloring and flavor must be avoided as these are well known to cause many allergic reactions in Boxers. Every dog breed has a particular set of health related problems that seem to crop up more often than in any other dog breed. Boxers are no exception. Although Boxers are happy, healthy and energetic dogs, they are prone to catching the following diseases, which can be avoided by feeding them high-quality dog food and in a balanced diet. Hypothyroidism is a common health condition in dogs and out of all the diseases that Boxers can get, hypothyroidism is probably the easiest to treat. Hypothyroidism is commonly known as malfunction in the thyroid gland when it is no longer capable of producing enough hormones to support all bodily systems. The typical symptoms of hypothyroidism in Boxers include weight gain, sluggishness, weakness, cold intolerance, and dull skin and coat. This can easily be treated by giving them thyroid hormone supplements along with proper exercise and a balanced diet. Bloat is a serious condition in Boxers that could be fatal if not treated immediately. It is basically swelling in the stomach causing it to twist and fold over in itself. If that happens, the dog is not able to escape stomach gases. Bloat is commonly caused by over-eating and is not to be mistaken as a severe stomach-ache because it’s way more serious as Boxers suffering from this condition only have a 50% chance of survival. So, as soon as you suspect bloat in your Boxer, take him to a veterinarian for treatment. Bloat can be reduced by feeding them a balanced diet and by avoiding foods that cause excess gastric problems in Boxers, such as wheat, corn and soy. Hip Dysplasia is a joint problem in hips. It is a common health condition in the larger and heavier dog breeds such as Boxers. It can get worse if your dog is over-weight. Hip Dysplasia can be treated by joint supplements, balanced protein-rich low-carbs diet for weight control and gentle exercises with less pressure on the hips. Boxers suffering from severe Hip Dysplasia may require surgery as a last resort. Allergies are another very common health problem in Boxes you can not overlook, especially food allergies. 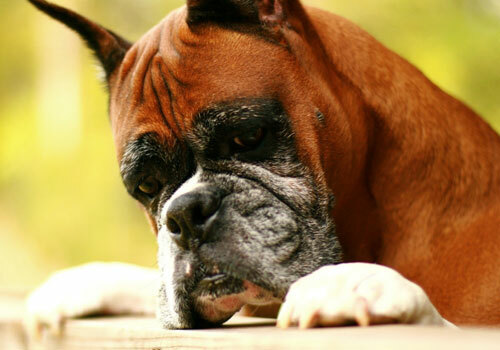 Boxers can sometimes become allergic to a food ingredient they had no problems eating before. These types of allergies are caused by high grain content in dog food, especially those that contain ingredients like wheat and corn. To treat such an allergy, you will need to identify the cause of allergic substance first and then replace it with other food supplement. Aortic Stenosis: Heart condition in Boxers. Cherry Eye: Health condition in Boxers caused by weakened tissues in the tear gland resulting in the gland popping out in a cherry-like shape on the dog’s eye. Heartworms: A serious and widespread canine disease. Pyloric Stenosis: A Stomach Disease commonly confused with bloat. Epilepsy: A genetic condition that can cause seizures in dogs. Boxer puppies younger than 4 weeks must be fed the most nutritious food available, their dam’s milk and nothing else. At the age of 4-5 weeks, solid food should be slowly introduced to the puppies, but they are still not able to consume solid food by itself. 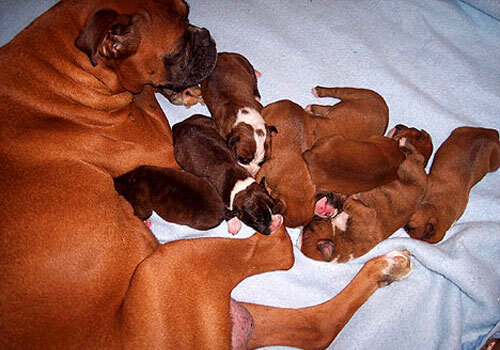 After the age of 8-9 weeks, you can slowly shift Boxer puppies towards feeding them only solid food. During this period, their growth will be rapid and they will gain weight very fast. Now you can also feed your puppy commercial food at least 3 times a day. At the age of 6 months, you should work your way down to feeding your Boxer puppy, 1 heavy meal or 2 half meals: one in the morning and one in the evening. Free feeding should be strictly forbidden now and treats or snacks should be given as a reward for training purposes only. After the age of 1 year, puppies are considered to be adult Boxers and should be fed high-quality dog food according to a dietary plan. Orijen dry dog food is a high-quality protein-rich dog food which is perfect for Boxers. 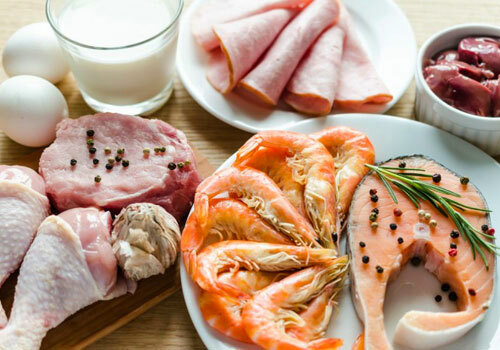 This food contains 38% protein, all of which come from high-quality sources, such as chicken, chicken meal, turkey, turkey meal, salmon, whitefish, whole herring, whole eggs, whole walleye, whole salmon, chicken liver and turkey liver. Since it is grain-free, it does not have any ingredients like wheat, corn and soy. 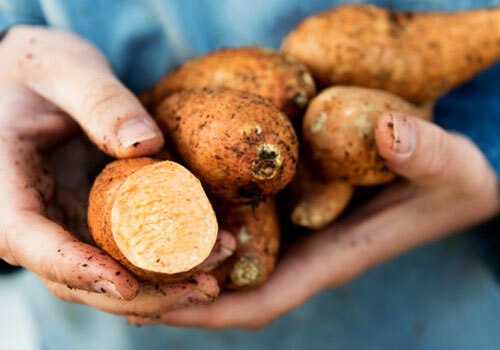 25% carbohydrates come from quality sources like lentils, sweet potatoes, yams and peas. 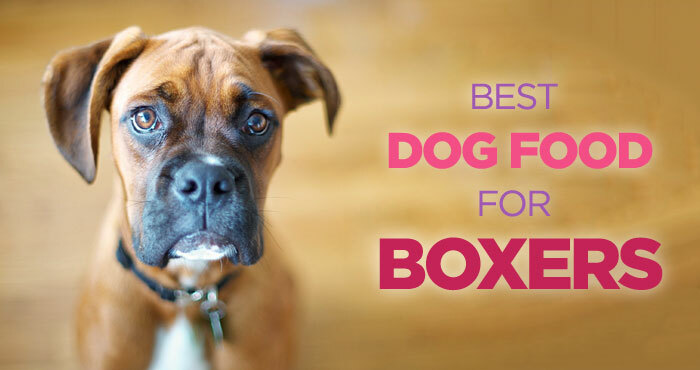 In addition to that, it has lots of vegetables and fruit which are great sources of various vitamins and minerals for your Boxer’s physical and mental health. Orijen dry dog food is an ideal choice as it fulfills all the nutritional requirements of a balanced diet for your beloved Boxer. It also does not contain any types of artificial preservatives, colors or flavors. If you are looking for a perfect dog food for your Boxer, then your search ends right here. However, it is a bit pricy since it contains high-quality food ingredients. Cheaper substitutes can be found, but you will have to settle with a lower quality of food. Orijen dry dog food is also the recommended dog food for Beagles as they also require protein-rich diets to maintain their health and support their active lifestyles. Orijen dry dog food is a grain-free meat-based dry dog food which uses various meats and organs as its main sources of animal protein, thus earning our 5 stars rating and a highly recommended status. Wellness dry dog food is another high-quality dog food that will fit right into your budget if Orijen dry dog food is a bit expensive for you. 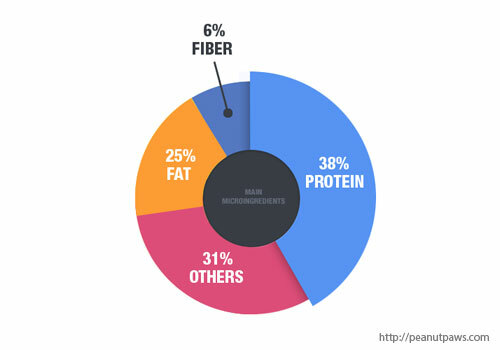 Protein content is 34%, which is more than enough for most Boxers. Good news is that all the protein comes from high-quality sources such as chicken, chicken meal, turkey and turkey meal. Although Wellness dry dog food has a 37% of carbohydrate content which is higher than Orijen dry dog food, there is nothing to be alarmed about because it’s a grain-free food and the main sources of carbohydrates are sweet potatoes and vegetables. Plus, they’re rich in natural fiber. I am also happy to see the amount of vegetables and fruit used in this particular food, especially apples, carrots, blueberries, parsley, kale and other great ingredients to offer a wide range of vitamins and minerals. It also contains enough calcium, glucosamine and chondroitin to help maintain bone and joint health. Wellness dry dog food is a grain-free, meat-based dry dog food which uses a notable amount of poultry and fish meals as its main sources of animal protein, thus earning our 4.5 stars rating and a recommended status. A good, premium, or high-quality, preservative-free dog food is generally the best choice for Boxers. These foods will be balanced for all type of Boxers. 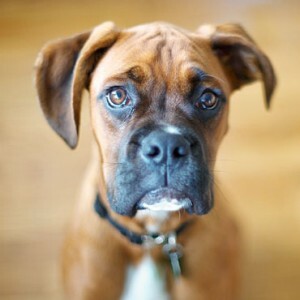 Boxers are full of energy, but have patience and are very protective in nature. That’s why they are amazing with kids. They love to play games with children to release their excess energy. To maintain the Boxer’s health, regular exercise is as important as feeding them high-quality food. Due to the protein-rich food they eat, they need lots of regular exercising to keep their body fit and avoid getting overweight. Keeping your Boxer at a healthy weight is the best gift you can ever give him. It will not only help avoid a lot of disease and suffering, but will also save you a lot of money in veterinary bills! Orijen Grain-Free Adult Dry Dog Food was reviewed by Brian Hersh on Dec 24, 2015. *Disclaimer: Our review on dog foods is based mostly on our expertise and the experts/veterinarians we consulted with and the information provided by the manufacturers. We do test many dog foods, but it’s not possible to test them all. As such, please remember the above recommendations are our opinions, and before making any changes in your dog’s diet, please consult with a local veterinarian. Very nice and very detailed information. I also feed Orijen dry food to my dog and he seems to like it very much. He is quite healthy from some time now and does less potty. I would also recommend Orijen to any one. It’s a little more expensive than some other brands but I believe it’s money well spent. I am happy as long as my dog is healthy and enjoys his food. Thanks Carla. I am glad you found it helpful. Let me know if you need help with something else! I have a question, please help. My boxer dog started throwing up couple of days ago and after that he does not eat anything but dog biscuits. We tried feeding him his food but nothing, we also gave him some food that you can give to a dog with upset stomach but he won’t eat. He seems weak and does not move a lot now. What is wrong with him? Is it dog food? Could it be something he ate? Food poisoning? Or is he sick? I suggest you call your vet and take your dog for a medical checkup. Better safe than sorry, and we all want your pup to feel better! * A poor quality diet. * Dog eats too fast. * Foods which contain starches and carbohydrates. * Lactose intolerance can also cause smelly gas. That being said, try switching your dog food. 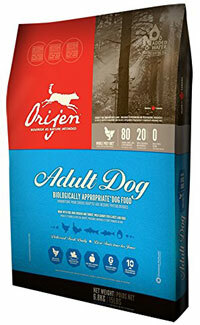 As suggested above, try protein rich grain-free Orijen Dry dog food. And give your dog exercise regularly. Also, avoid dairy products. I have 2 almost 5-month-old Boxer puppies. I would really love to fix the food for them myself. Can you send me a choice of foods to cook & grind up for them? The vet said it would be fine but to be sure and give them good puppy food also. Thanks for any help you can give me. Yes, it’s perfectly fine to feed home cooked meal to your boxer puppies. But make sure you feed them a balanced food. With the raw or home cooked meal, it’s very easy to miscalculate nutrition. The food you are providing must be easy to digest so do not use grains like wheat and corn. Puppies love fruits and vegetables. You can give them apples, carrots, beans. But as your vet suggested, make sure you feed them a good-quality dog food as well. See above for some recommendations. Is it only best for boxers or Dalmatians can have it too? Dalmatians are little different from Boxer dogs and in general, weight less than Boxers. So these foods may cause some health problems in your dog. If you want to try one of these foods, then make sure you buy a smaller quality bag from Amazon. Make sure to move your dog gradually from old dog food brand to the new one, and monitor any unwanted symptoms. Thanks for sharing such knowledge. Your help is really appreciated. Thank you for such an informative article. I have a quick question for you about another brand. 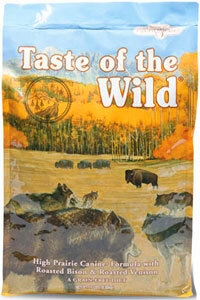 I’ve read a lot about “Taste of the Wild” brand dog food, and I’m wondering if you evaluated this brand and how it seemed to stack up to the rest. It’s been highly recommended by several owners, but I’ve not seen it in a comparison like this. Any thoughts/advice are greatly appreciated! Scratch that last comment–pretty dumb. I misread the last brand, and plainly see now that it made your list (just the last of the 4). Thanks again! Don’t worry about it. I am glad you found the answer to your query. “Taste of the Wild” is one of the most popular brands of dog food and in general, it’s good for almost all dog breeds and safe to feed as well. But muscular dog breeds, such as Pitbull, Boxers, Beagles, etc., need protein rich diet to maintain their overall health. Hello, I have a 4 yr old boxer that will NOT stay out of our cat’s food. We put it out of his reach but the cat has to eat too…he is very gassy, not smelly though…he has to be crated during the say due to the cat food…can you give me any advise? I am going to start giving him the low fat plain yogurt she I feed him 2x day.. I am also switching him to Pro Pac grain free food from pet supplies plus. Is there anything else I can do? He also seems to be hungry all of the time..we call him a food their..lol! He will even sneak food off of the island in the kitchen or the counter if we don’t put it back far enough. I will be open to any suggestions you have…thanks, Zekey’s mom..
Don’t worry too much as a little cat food is not going to hurt your dog as long as he eats it occasionally. But letting him eat your cat’s food on a regular basis could make him very sick and obese, since dogs and cats have different nutritional needs. There is no better way to stop a dog from eating cat food, but monitor him, train him and put cat food out of his reach, such as high up on a tall cat post or even in a separate room of your house. There is also a product called “MeowSpace” and it can help you with this problem. It is a clear plastic enclosure with a locking door that only opens by a magnetic collar which cat can wear. Thank you for this information, it was extremely helpful. I have a 10 month female Boxer. She is extremely active, lol. She’s been on Whole Earth since we got her at 8 weeks. I would like to switch her to either Orijen or Wellness CORE upon her first year. Currently she eats about 2 cups per feeding (twice a day). How much should she be eating at the one year point? This is the right time to plan your dog’s diet. You may start switching her food as soon as next month. When switching her to adult dog food, do it gradually over the period of 7-10 days. You should mix well old and new dog food and gradually increase the amount of new dog food. Keep feeding her 2 half meals a day: one in the morning and one in the evening. Since your dog is still growing, 2 cups for each meal is fine for now, but after she gets 1 year old, reduce it to 1 and a half cup each meal. Orijen offers ~475 calories per metric cup. Don’t feed anything else, give treats occasionally and give her lots of exercises. If she gets her fair share of treats, you probably want to reduce each serving to 1 cup only. Great article, thanks. Do you recommend a specific dog food for Boxer puppies? Ours is currently 6 months old. Orijen Grain-Free and Wellness CORE Original both are great foods for puppies. I have a 4 year old male boxer who skin and coat hair has started shedding to bald spots. First I was told it was skin allergies spent $500 at the vet with pills no change. He first started eating Nutro, then I swapped to Blue Buffalo, 4 Health made him extremely gassy neither food has brought back his coat. Now we are trying Whole Earth Farms. I have tried fish oil pills. I’m lost trying not to spend much money at the vet after the first episode. Any suggestions? First, you need to know for sure what is causing the allergy in your dog. For food allergy, there are many better higher quality foods available to choose from. Wellness, Orijen, Taste of The Wild, California Natural, etc… We already suggested some great options in this article. Often times food allergies are protein related, if she is/has been eating chicken or beef try Lamb and Rice, Venison, etc… Eliminate all treats/people foods and pick up a healthier snack. Natural Balance makes a great Potato & Duck biscuit for food allergy prone dogs. Food allergies are really about the process of elimination… A lot of allergy type foods now have far fewer ingredients in them, and that helps to sort out the culprits. I am glad you found our articles helpful. Let us know if you have any question or need any help. Hi, thanks for your help. Your website is really helpful. Keep up the good work. Thanks for your feedback. I am glad you found it helpful. Love your recommendations! Thank you it’s been a great help and very detailed article. I have a 3 yr old boxer and she does have allergies so I will take your recommendations but Wellness as I am unable to find Orijen in Canada. Are there any others you would recommend that would be available in Canada? If you are not able to find Orijen or Wellness Core in Canada, then you can try Taste of The Wild or Blue Buffalo. These are all great choices for Boxers. Hi Michelle, I have 6 month old boxer puppy, I feed Evo red meat dry food to my dog since a little more than 3 month ago, and I can see that she’s growing with strength, but maybe a little faster considering her age, and I was reading in some webpages that the boxers should be fed like a large breed puppy, so my question is about the kind of food that I’m using for my puppy, in this case Evo, my fear is for the amount of Protein of this food, around 46% and calcium level about 2,2%. What do you think about that brand for boxer puppies? Protein is excellent for muscles and bone growth for larger dogs like Boxers. So protein rich dog food is, in fact, good for your dog. Unless your dog’s growth is abnormally fast, you should not be worried. 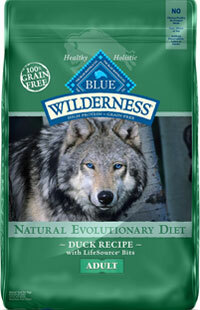 Although if you are worried, you can try dog foods from Taste of The Wild or Blue Buffalo. These are all also great choices for Boxers. Great Article, I have an 8 month boxer\lab mix, very much boxer with his allergies. 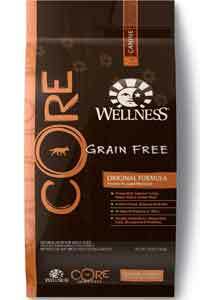 I have been using Wellness Core Grain Free for puppies, and it was working well. On the last two batches of dog food, my pup has started scratching and had a bad case of diarrhea for a few days, he got better after a week. This morning I opened a fresh bag and he had another bad case , I will be taking him to the vet tomorrow morning. Any suggestions, I was thinking that Wellness may be causing this, as I have already eliminated his treats and other possible causes. Do you have any recommendations or other dog foods, Orijen seems great, but it can be costly, any luck with Taste of the Wild? Yes, you can try Taste of the Wild. It is one of most recommended dog food brands and very popular too.